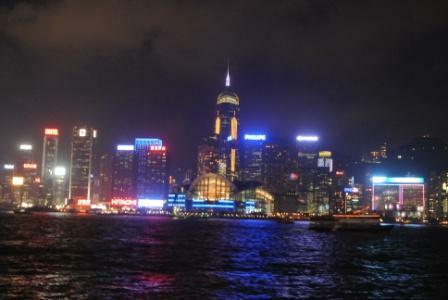 Hong Kong skyline is one of the best view in the world, especially at night. I know. I know...you think that I am bias. But wait till you see it, you will second what I just said. 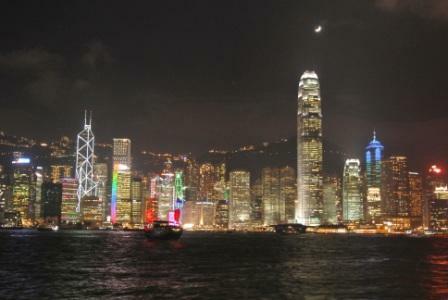 There are several ways to appreciate the HK skyline at different times during the year. You will appreciate its beauty in a different way, too. ride, watch the Symphony of Lights (that I am going to share with you my extraordinary experience soon) or DO THEM ALL. In my opinion, night time is the most beautiful time of the Hong Kong skyline. But the bestest of the best is Christmas and Chinese New Year. The Symphony of Lights is the laser show organized by the Hong Kong Tourism Board featuring 44 famous buildings on both sides of the Hong Kong Victoria Harbour accompanied by music. Actually, those buildings are mainly concentrated in Central, Causeway Bay and Tsim Sha Tsui. Believe it or not, this laser show is the world's largest permanent light and sound show according to the Guinness World Records. Amazing, huh? 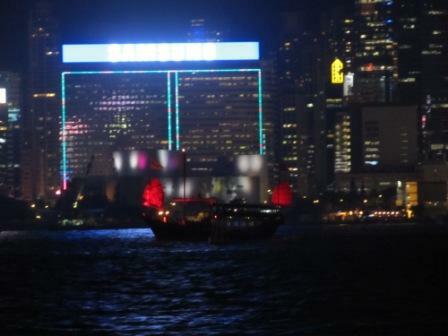 The Symphony of Lights is on every night at 8pm Hong Kong time as long as the weather is good. If it rains or expects hurricane, the show will cancel. The show lasts about 15 minutes. There are pyrotechnic fireworks on top of the buildings for special occasions, such as Christmas and Chinese New Year. Although you can also appreciate the multimedia light and sound show while you are in the Star Ferry or the Junk Boat, I would recommend not to. The ride will interrupt you. It's definitely better off to stand still at a spot to enjoy it. My family has very different opinions about which is the best area to watch the Symphony of Lights. My mom and my youngest sister thought Wanchai is the best while my other sister thought Tsim Sha Tsui is the best. We were in Tsim Sha Tsui when we watched it. I can't tell you which is the best. Although I have seen Hong Kong skyline throughout my life living here, I still think that it is an OUT-OF-THIS-WORLD experience. It just makes it more beautiful and glamorous in a very different way. Less than 5 minutes before the show started, some lights shone on the participating buildings. Just before the Symphony of Lights starts, lights shines on some of the participating buildings. 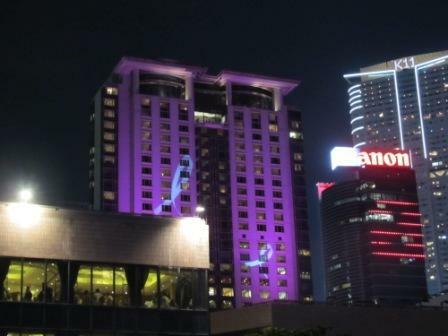 This is the Peninsula Hotel featuring the awareness of breast cancer. I was getting anxious and excited. There were many people waiting for the show to start, just like us. Since the area for people to appreciate the Symphony of Lights is realtively big, it didn't feel too crowded or unbearable like going to any Hong Kong market. It started with the greeting, then the music. And....the Symphony of Lights officially started with introducing each of the participating building. What was nice about it was that the building would flash the lights at the time of its introduction. So, it gave you a very good idea about which is which. As mentioned earlier, the show involves both sides of the Hong Kong Victoria Harbour. So, your attention will mainly focus on the opposite side of where you are at. The day we went, the sky was clear and breezy. The lights just followed the music. It was FABULOUS. It lasted almost 15 minutes. The only advice I would give you is that bring a light sweater or jacket with you. After standing there for 5-10 minutes, it started to feel chilly, not to mention about standing there throughout the entire laser show. I was holding the camera to record the Symphony of Lights. And I got to tell you this...You MUST watch this show with your own eyes. Whatever you see on the video doesn't do any justice of how spectacular of the Hong Kong skyline and the Symphony of Lights are. So, next time when I go back home, I will just stand there and watch it. 1) Get off at Star Ferry Wanchai Pier. Walking towards the direction to Hong Kong Convention and Exhibition Center along the harbour. About 5-minute walk. 2) MTR Wan Chai Station, Exit A5. Walk across the footbridge, then turn right and head through the lobby of Central Plaza. Continue across the connecting overhead walkway, then descend to the ground level. Walk towards the waterfront ahead and the statue and monument will be on your left. The entire walk takes approximately 15 minutes. 1) Get off at Star Ferry Tsim Sha Tsui Pier. It is just less than 5-minute walk away. 2) MTR East Tsim Sha Tsui Station Exit J, walking towards the habour front. If you see the Clock Tower, you are at the right area.